Restrict access to specific people on certain days and/or times of days. Restrict general access to certain days and/or times of days. Track when access was given. Immediately add or eliminate access to the facility. Eliminate the issues with keys and re-keying of doors & locks on a regular basis. Some of the most selective organizations in the world put their trust in Jade's Access Control system. SecureCard is approved by the Department of Homeland Security for school lock-down scenarios. The system is also approved by Department of Defense due to its high level of encryption capability. 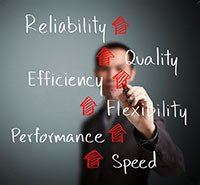 Along with the benefits of its robust feature set, Jade SecureCard offers unparallelled system dependability. In the event of a power failure the system will continue to function. It will operate even if the communication link with our Central Station Monitoring Command Center is lost due to lines being down in inclement weather. Jade Alarm Co. systems are extremely flexible and easy to use. Each individual is assigned a card or fob. That device is then assigned a position within a matrix that is setup for your establishment. This matrix allows or denies access based upon the authority level of this individual card or fob. If someone attempts to enter when they are not allowed, this will show on reports that we can generate for you. You can choose to self-administer your SecureCard system or have it remotely administered by our Central Station Monitoring Command Center in our secured facility. Approximately 85% of our valued customers choose to have Jade administer their system for them, secure in knowing that we are there to assist immediately if there is an emergency. You may prefer using physical door keys for access control but are occasionally faced with personnel changes that require costly rekeying of your facility, Jade has a solution for that, also. 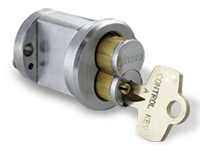 With SmartLoc Rekeyable Cylinders, changing keys has never been as fast, easy, or cost-efficient. With SmartLoc rekeyable lock cylinders, you are in complete control of your own security. Change keys in seconds, at the door, without paying a locksmith or tying up the valuable time of maintenance personnel. In fact, you don't even have to remove the lock. Our patented technology allows you to reset your lock to match a new key effortlessly. With up to 15 unique key changes per lock, it's like having 15 locks for the price of one.